What to eat, Sunday tonight | Mexican. Anything, Mexican. So, now that I’ve got New Mexico on the brain (and there’s only three days left on this Lent-inspired “no cheese” thing), we’re ready to start drooling over Mexican food again. It’s a staple in The Colosimo Casa because we love all things cheesy and anything you can dip a tortilla chip into. Plus, it’s one of the cheapest ways to eat a variety of meals without calling it leftovers. There are a couple of tips to surviving this strategy – 1) Keep an inventory of chicken in your freezer, 2) Always have sour cream and salsa and 3) Get to a comfortable place with cheese. We’ve compiled three of our favorite staples that are easy, quick and pretty fresh in the realm of things south of the border. A tip? Enjoy. Another tip? Don’t be afraid to use your hands or go for seconds. …Although leftovers are pretty damn good. Ingredients | 4 soft tortillas | 2 Chicken Breast, boiled and shredded, 1/2 Cup Cheese of Choice (we use cheddar), 1/2 Cup Sour Cream | 1/2 Cup Salsa | Cumin, Chili Powder, Onion Powder and Garlic Powder, 1 Can Black Beans heated up in a sauce pan (salted to taste) and 1 Box Rice-A-Roni Mexican Rice (gluten in that, totally, but it is so good). What to do: Once you shred the chicken, mix in all the spices and sour cream. Spoon hearty amount onto one half of a tortilla laying in the frying pan on Med-Low Heat. 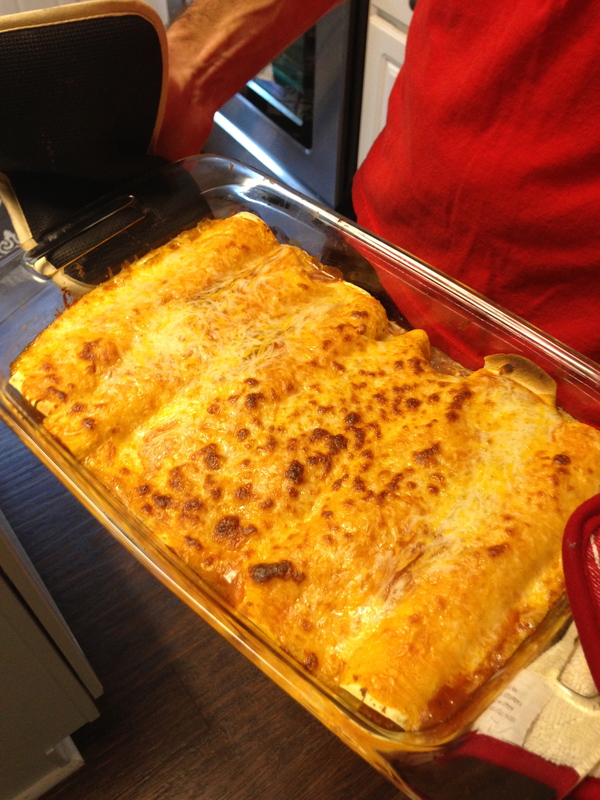 Top with cheese and fold over. Flip after a few minutes (and when the cheese is melting). Don’t let the tortilla roast! When done, slide out of the frying pan, slice and serve topped with fresh salsa, guac (if you like it) and more sour cream, alongside rice and beans. This should make 2 each. Here’s How to Assemble | Lay the tortillas out in the pan, ends holding ends up. Mix the chicken, spices and sour cream together and then spoon into each tortilla. Roll each one up so that folded end is face down. Pour salsa over it all and top with as much cheese as you think your digestive system can handle. Bake til it bubbles! …how’s that for the easiest thing ever? A lot of times, I don’t feel like using more dishes than I have to. 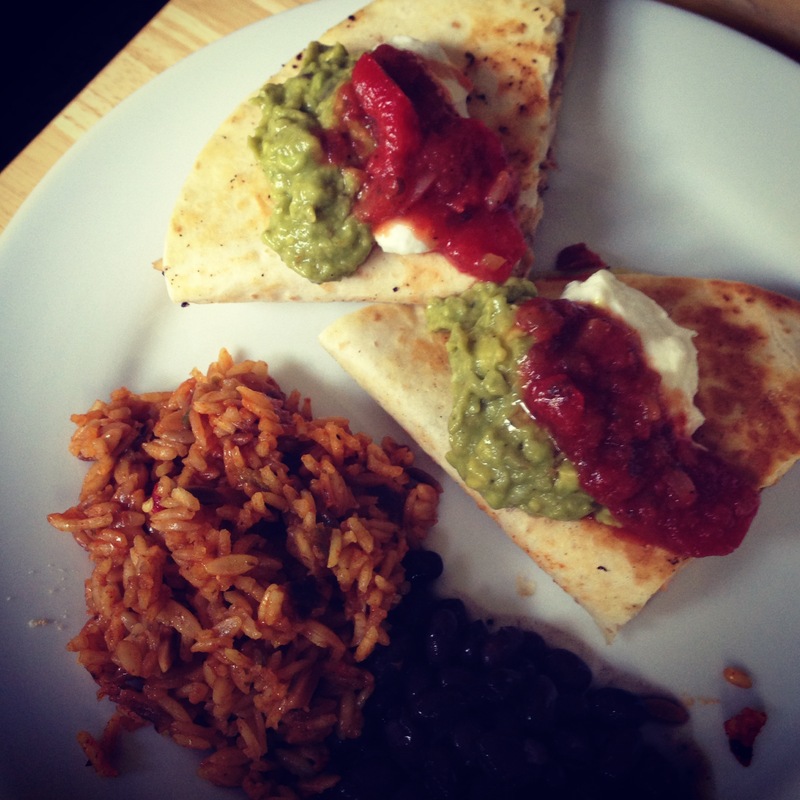 And, when I am feeling the need to cut some carbs, we need an alternative to tortillas. So, the answer is just pouring it all on a dish. But, the secret to that being passable as a real, justified meal is the Rice-A-Roni Mexican Rice. Guys, no it’s not Gluten Free, but guyssss, it is so good. The flavor carries a dish so much that you don’t have to get any fancier than just making it a base. 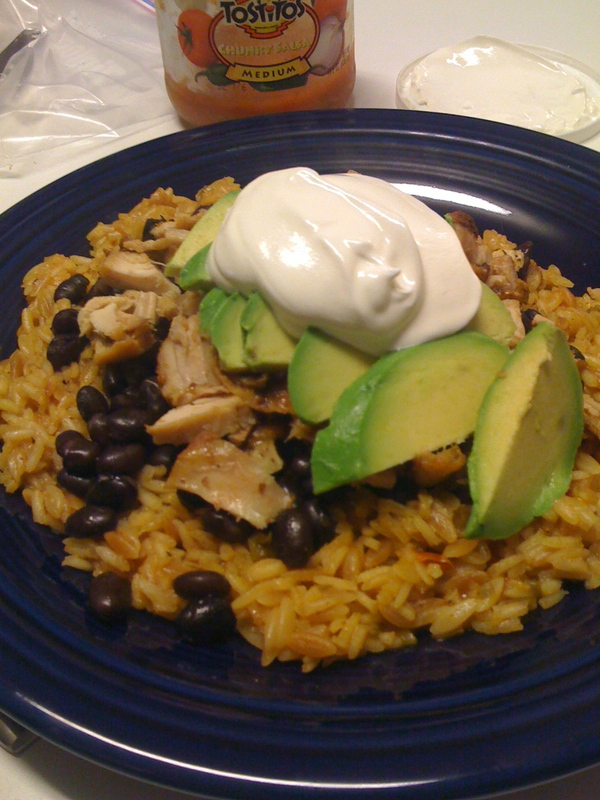 So, we topped it with black beans, chopped chicken, fresh avocado and sour cream/salsa. It’s hearty and fresh and didn’t require cheese to be delicious. I don’t even feel like I need to type out a formal recipe, because you should make it your own and it should be committed to memory already.